The Critical Mass Budapest demonstration is a real success story that has contributed to a breakthrough in terms of both public opinion and political attention. Until recently the majority of urban cyclists who pedalled on Budapest streets did so for leisure only. Commuters were rare, largely due to the non-existence of a coherent system of basic cycling infrastructure. In 2002 the dedicated Budapest bike path construction budget was entirely cut with the justification that “hardly anybody uses them”. No cycle paths meant no cyclists and therefore no budget. But how to break this vicious circle? The goal of Critical Mass Budapest demonstration is to promote the bicycle as a healthy, fast, cheap and environmentally friendly mode of transport. The organisers of this event encourage the local population to use their bicycles for transportation whenever possible, and not just for recreation or sports. The Critical Mass movement originated in San Francisco in 2002, and since then the Budapest event has evolved into one of the world’s largest such events. It is non-political and is organised in a grassroots manner. It all began in 2004, as a spontaneous reaction to the Budapest Mayor’s decision to move the car free day to Sunday as the “car traffic should not be disturbed”. Led by bicycle couriers and their friends, the first bicycle demonstration was organised in less than two weeks and attracted more than 4,000 people. Since than the Critical Mass demonstration has been organised twice a year (on Earth Day and on the Car-Free Day), with greatly growing participant numbers: 10,000 (2005), 32,000 (2006), 50,000 (2007), and reaching the amazing figure of 80,000 this year. Although the Critical Mass demonstration itself is nothing more than a crowd of people taking a ride together in the city, the sheer number of participants triggered major media, public and political attention. The non-profit organisations who co-ordinated the event went one step further and used these demonstrations to demand political action and increased budget allocations. The results on both the political and the road user sides are impressive. A biking faction was formed in the Hungarian Parliament, with representatives from all political parties. Spending on cycling infrastructure has been allocated a separate budget line. The Bike Path Fund was created, with 3% of dedicated budget from the overall annual road development budget. This decision was made with a unanimous vote, with the Critical Mass also being a discussion topic at the parliamentary session. In 2007 the Minister of Transport announced the doubling of the annual budget for cycling infrastructure, along with the allocation of €168 million EU development funds until 2013. 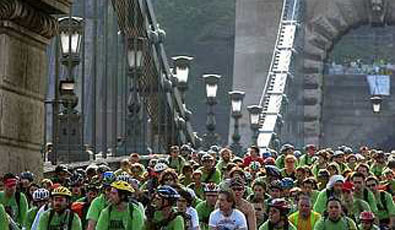 By the summer of 2007 the “Biking Hungary” state programme was officially launched. In addition to these successes on the political side, the results are visible on the streets: in 2006 the number of regular cyclists doubled in Budapest - and in 2007 again! The 2005 Critical Mass rides constituted a real breakthrough as they directed continued media attention towards the events and related issues, and several other Hungarian cities and municipalities began organising their own rides.>Negotiations began with the Budapest City Council, resulting in an increase in the length of bicycle lanes and paths constructed (from an average of 1-2 km/year to 30 km/year). The planning process now incorporates consultation with experts involved in Critical Mass. Similarly, the Hungarian Ministry of Economy and Transport has appropriated a substantial budget for establishing bicycle routes nationwide. At a March 2006 ride organised in the light of upcoming Hungarian Parliamentary elections, Critical Mass participants stopped by each of the four parliamentary party headquarters, lifted their bikes above their heads, and delivered a petition containing recommendations for improving bicycle transportation in Hungary. The event was called "Tour de Voks" ("Tour de Votes"), and each party responded to the petition with its own bicycle programme. Critical Mass held the winners to their promises on 2 December 2006, when - despite cold weather - some 2,000 bicycle demonstrators protested the government's budget and development plans, which fell short of earlier promises made for bicycle-friendly transportation projects. Government officials later corrected their plans; the Hungarian Parliament established a "Bicycle" committee and unanimously approved separate line items for bicycle-related projects. For the first time in Hungarian history, Critical Mass was mentioned in Parliament. The largest ride so far was the April 22, 2008 Critical Mass / Earth Day demonstration, which attracted an estimated 80,000 cyclists. The event was officially launched by the Dutch ambassador to Hungary, Ronald A. Mollinger, symbolising the popularity of cycling in the Netherlands now spreading to Hungary. László Sólyom, President of the Republic of Hungary, also participated on two occasions (in 2006 and 2007) and rode along with the participants, rendering - at that time - unprecedented esteem to an unprecedented turnout in Hungarian as well as international terms. Other prominent individuals who participated included government ministers, the Mayor of Budapest, and many celebrities. Critical Mass was also a constructive partner in government programmes that supported cycling, and played an important role in promoting the successful Bike to Work campaign, initiated by the Transportation Ministry. Though initially at odds with them, the Budapest City Council eventually gave Critical Mass organisers a Pro Budapest award for their efforts in promoting cycling as an alternative mode of urban transport and improving the transportation culture in the capital city. Possibly the greatest accomplishment is the fact that the number of people using their bicycles on a daily basis in Budapest doubled for three years in a row after 2004, a growth rate unmatched anywhere else in the world, and it is still on the rise. We believe that we are slowly building a cleaner, more liveable, and bicycle-friendly Budapest.